A very important, sobering study of psychiatric overreach during a quarter-century (roughly 1948—73) in treating three psychotic or near-psychotic illnesses: schizophrenia, autism, and obsessive-compulsive disorder. 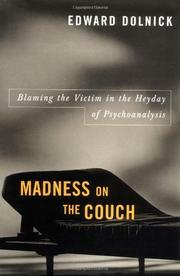 Dolnick, a veteran science and health journalist (formerly with the Boston Globe), notes how prone to “parent bashing” leading psychiatric and psychoanalytic theorists were during this period. Thus, Frieda Fromm-Reichmann coined the term ’schizophrenic mother— in 1948, and Gregory Bateson (more an anthropologist than a psychologist) in the mid-1950s alluded ominously to parents of schizophrenics placing their children in highly anxiety-provoking, unresolvable dilemmas termed “double binds.” Bruno Bettelheim, who for many years was seen as a pioneer and kind of national guru in the treatment of autism, wrote in 1981, “All my life I feel I have been working with children whose lives have been destroyed because their mothers hated them.” Theorists also often based their absolutist, increasingly widely held conclusions—that parents had caused the illnesses and that mental-health professionals alone could cure then, largely through talk therapy—on the most unscientific of methods. Sometimes they worked with ridiculously small study samples, as in the case of psychiatrist Theodore Lisz, who wrote for many years about schizophrenic patients after studying all of 17 upper-class New England families. Ultimately, of course, their theories and practices proved almost entirely wrong; psychoanalysis was found to be largely useless in treating the severer mental disorders. In addition, the discovery and effective employment of psychotropic medication, beginning with thorazine in 1952 and culminating with Prozac during the 1990s, demonstrated that severe, and many lesser, emotional and mental disorders are largely rooted in biological imbalances, not in individual or familial psychological dynamics. Dolnick provides valuable information on Freudian, non-Freudian, and contemporary theories about the three illnesses he examines and on how long-held views gradually were debunked during the late 1960s and ’70s, and he writes in a tremendously engaging and informative manner. This cautionary tale of pseudo-scientific hubris my well be not only the year’s best book on a mental-health topic, but also one of the most compelling works of its kind in this decade.